So you want to be an Event Photographer? Event Photography opportunities are everywhere, but you need to know how to get the best out of them. There are THOUSANDS of football tournaments every year with hundreds of thousands of Under7's through to Under 16's of children, both boys and girls playing weekly. This is a HUGE and very lucrative market, last year we TURNED DOWN around 40 such tournaments, that's about 48,000 missed photo opportunities! To make a good living from this discipline you have to catch the shots parents want to buy, no room for 'artistic interpretation' here, good photography is needed but you have to be a "Money Shot" shooting machine! 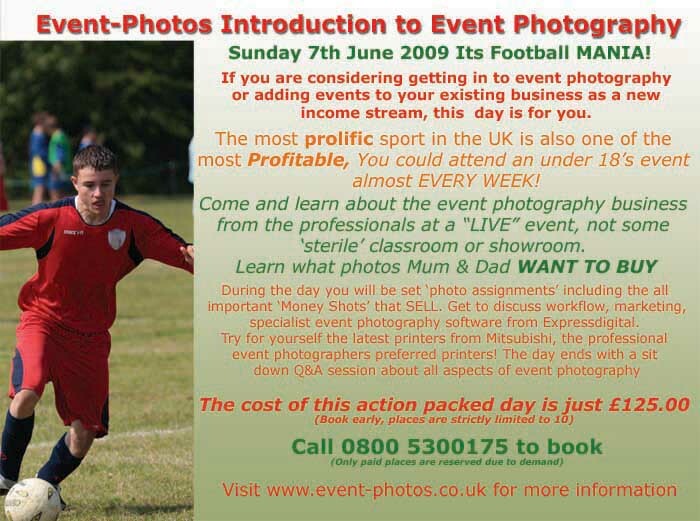 Come and learn from the professional event photographers who earn their FULL-TIME living from events such as these, not those who just talk a good story on forums! This is a 'LIVE' event that will be covered by one of our existing Event-Photos event teams, see the buying patterns of the customers for REAL! Call 0800 5300 175 to book your place on what could be the most important training session this year.